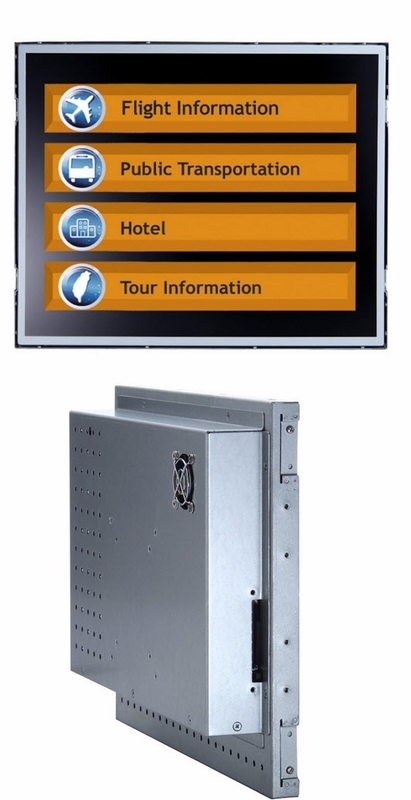 The FDK190-830 is an open frame display panel computer with outstanding flexibility, configurable in a variety of ways to deliver best ROI for a variety of applications. It features Intel Atom processor N270 1.6 GHz with a 19" LCD display with up to 1280x 1024 resolution, providing a very cost effective low power solution. Designed to integrate into your custom enclosure, this unit offers an open frame slim design architecture for easy fit. The FDK190-830 is ideal for indoor kiosk, HMI automation, signage and other applications. The system is only 65mm deep and provides narrow bezel widths of 13 ~ 15mm for space-saving custom bezels and enclosure applications. A resistive touchscreen option is available for interactive user interface requirements. Optionally, when ordered without touchscreen you get an even lower cost solution for dynamic signage or informational applications. The hidden but accessible brightness adjustment on back cover protects against end user access. One PCIe Mini Card slot is standard for I/O expansion such as WiFi, 3G connection, or other 3rd party I/O cards.